I didnt find this droptower as exciting as I had expected. Perhaps the problem is that by spliting the ride into two attractions (a blast up ride a and a blast down ride) rather than combining them, they have made each ride half interesting. Also, the total lack of a theme is a minus compared with, for example, the Tower of Terror at Disney, Down Time at Lake Compounce or Dr. Dooms Fear Fall at Islands of Adventure. Blue side gets a 10, red side gets an 7. The drop side is very scary. When I rode it, I was facing the opposite tower, and that gave me an idea of how high up I was. We stayed up there for a few moments until the awesome drop. You float all the way down 24 stories, so its easy to make the best out of it. Im not even sure that the small bounces were necessary. Many trembles out of the exit. The red side wasnt all that good. I guess many people enjoy the powerful gs when they are fired upward, but it didnt do it for me. I couldnt savor the view way up there very much because we were going at about 45 mph. The drops on this side were but a preview for the blue side. Not much airtime. Its a Space Shot, so what do you expect? This was my only major drop tower that Ive been on. Drop side rox, the firing side blows. Check out both of them and see what you think. Hmmm, didnt know whether to award this with an 8 or a 9, but I think a 9 is deserved. My favorite part of this particular attraction is the amazing view provided on the upward duration of Turbo Drop. The Earth around you, mainly Lake Erie, seems to circularly warp downward as you progress. Once at the uppermost point, riders are presented with what feels like anxiety for an eternity. The drop comes as an intense surprise, and the "re - bumps" provide for amusingly fun excitement. A very solid addition which dominated the parks skyline for one season, until the big bad blue beast was added alongside the shoreline. I wasnt that impressed with CPs Power Tower. Being a Valleyfair ride op, I constantly heard about how amazing it was compared to our version and on and on...at VFs PT, I ALWAYS have a flutter in my tummy when I go up the Turbo Drop towers. Every, dang, time. And also most of the time with our Space Shot tower. But not at CP. It could also be beacuse PT and TTD are right next to each other, but I didnt feel the "holy-moo-Im-gonna-fall-off-and-die," butterflies that normally accompany that familiar CLICK (more like CLUNK) when you hit the top of the tower. Also, Im not one for how a ride LOOKS (I mean really, how creative can you get with a tower? Not very) but CPs PT is pretty much the most hideous thing Ive ever seen. The top just boggles my mind because its so useless...its possible this tower could get more points if they shortened the topper and used more tower for the actual ride. 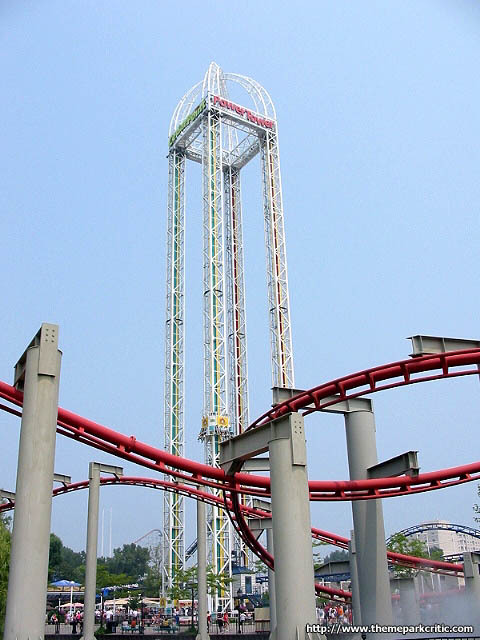 These tower rides dont rely on fast speeds or super-thrilling drops by default, its all simple theatrics, which is why the drop towers are generally preferred. Its scarier when youre all the way the heck up there with eleven of your new best friends with your feet dangling and the wind blowing as your only soundtrack, than when youre down at the bottom waiting for the slightly-predictable inevitable and everyone is bustling about and doing whatever. Power Tower at the Point is dwarfed by the monstrous (and amazing) Dragster, and its footprint is so small that it just gets lost and forgotten in the shuffle and hustle and bustle to get to TTD or Magnum. 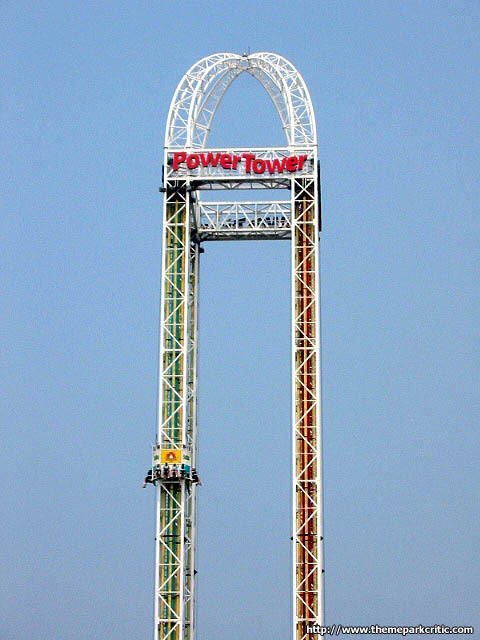 Hate me as you will for ever comparing Valleyfair to CP, but I think, at least, that our Power Tower has the Points beat hands-down, although Im not sure thats a really big feat, haha. Great thrill ride but always scares me alot on the launch up tower b/c of not knowing how long til take off and rising out of your seat at the very top. Ive never been on the tower that brings you up slow then drops you. I like the sound of the rushing air from the hydraulics while waiting in line but it still creeps me out. The Power Tower is mostly fun. Not very many people agree with me, but I like the shooting up side better than the shooting down side. Shooting up is not very intense but its fun! When you get to the top you kind of jump out of your seat which is exciting for a second. This side has a very little wait if any, so I would ride it! The shooting down side is really scary! I can ride Top Thrill but I dont like this. The long ride to the top is very high. When you get to the top it clicks and shutters which scared me so much! The 10 second wait at the top was horrible for me. Shooting down was okay but not really that exciting. 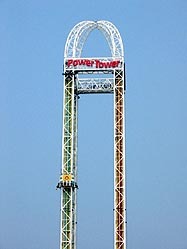 Shooting up is a 9 and down is a 5 so I give Power Tower a 7. Power Tower was a lot of fun & now its the best freefall Ive been on up to date. The 300 ft. tower was huge. I only rode on the red side since I was getting used to it, but being shot up 240 ft. in the air was amazing. It had some great airtime at the top of its peak. Definitely ride PT if you want to experience a true freefall w/scaling heights that provides a great view of the park. I only went on Space Shot, so this review is only for Space Shot. It had a good launch, great views, and not a long line. Theres a lot of air from the first time you go up, but each other time, theres none. I enjoy the space shot a little more (because of the launch) but like the drop part too. Ill usually ride the drop side when the park is less crowded but as others have said the space shot side is generally a shorter queue. I am rating this ride on the shooting up side. I never did ride the down side. I didnt ride the down side because it had a huge wait. It mustve been better.